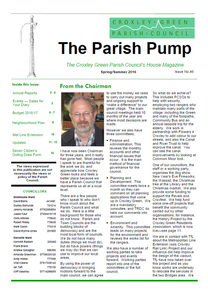 Cllr Tony Bennett—has lived in Croxley Green for 9 years and worked in Croxley as an Estate Agent for 11 years. Cllr Bennett is 43, married to Jackie and has two children William and Aimee. He went to Rickmansworth School and has been a member of the E&A committee for 2 years. 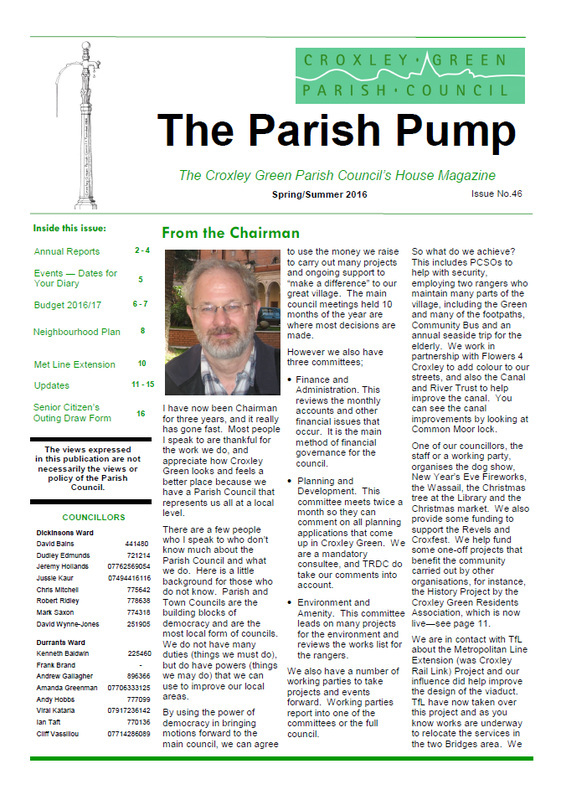 Council at full strength - For the first time in a number of years, the Parish Council is at full strength and up to its maximum of 16 Members. 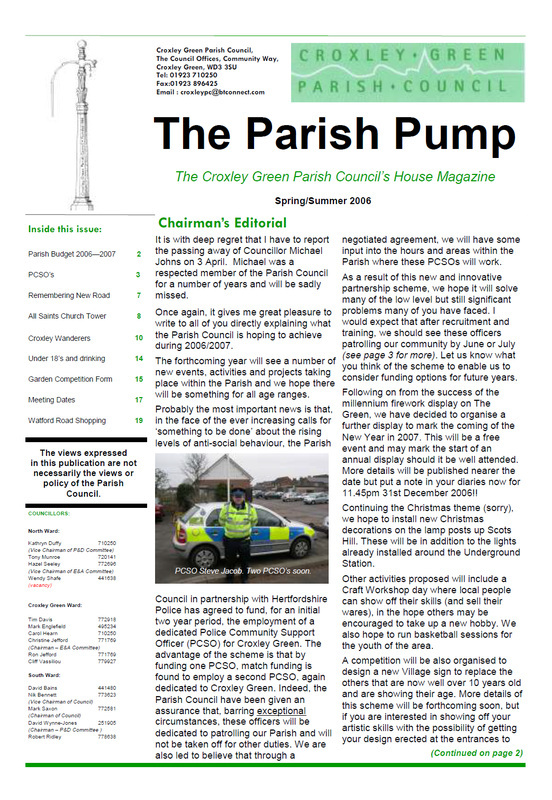 Chairman of the Council, Cllr Mark Saxon said “This is an excellent position to be in. 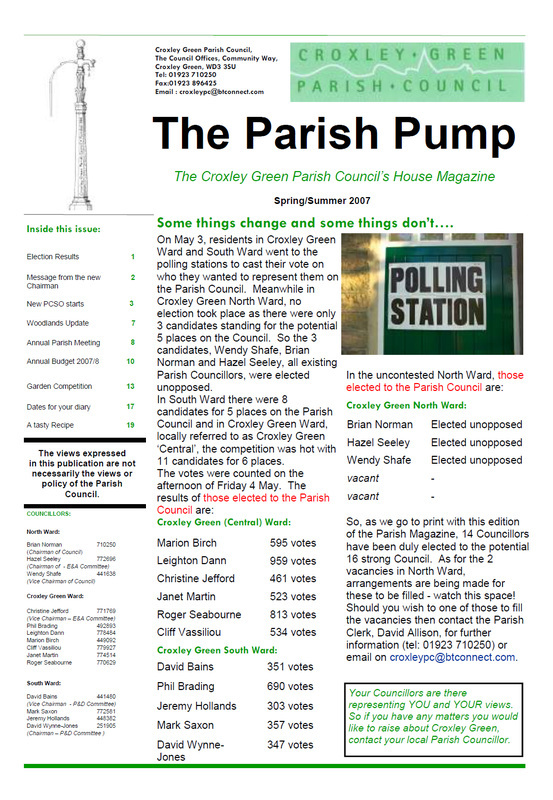 With new Councillors representing their Ward Parishioners, their views and opinions will greatly add to the quality and depth of discussions at meetings for the betterment of Croxley Green. I recently called to talk to Dave and Carol Edwards to discover the story behind the “Christmas House”. Dave told me that the whole idea started in 1978 with the decoration of the porch, and this, like Topsy, “just grew and grew”. He has no specific plan for the decorations, but certain items do have particular places. The decorations start to go up during the second week in November and this takes three weeks to complete, but only two days to take down! So who spotted the deliberate mistake! dog. 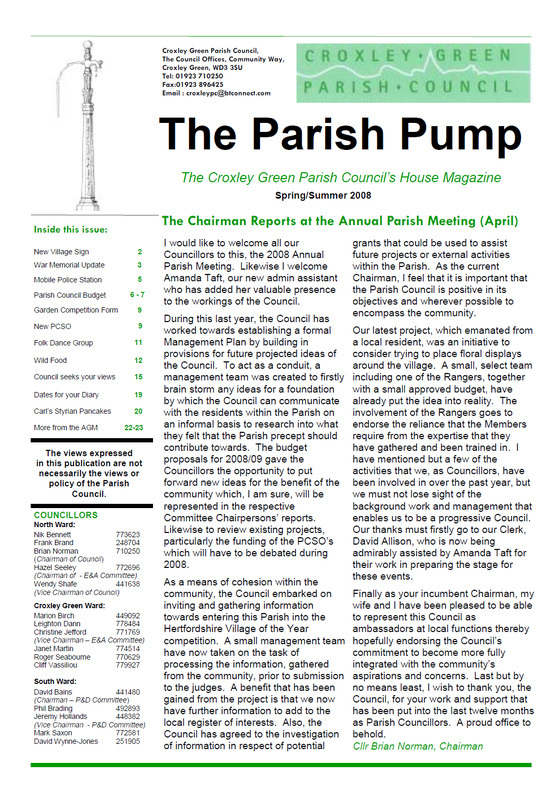 Ms Matheson’s name was picked out of a hat from those who entered by Councillor Kathryn Duffy at the Parish Pump magazine Editorial Committee meeting held on 7 February. Ms Matheson wins a framed copy of the Parish Map. Well done! 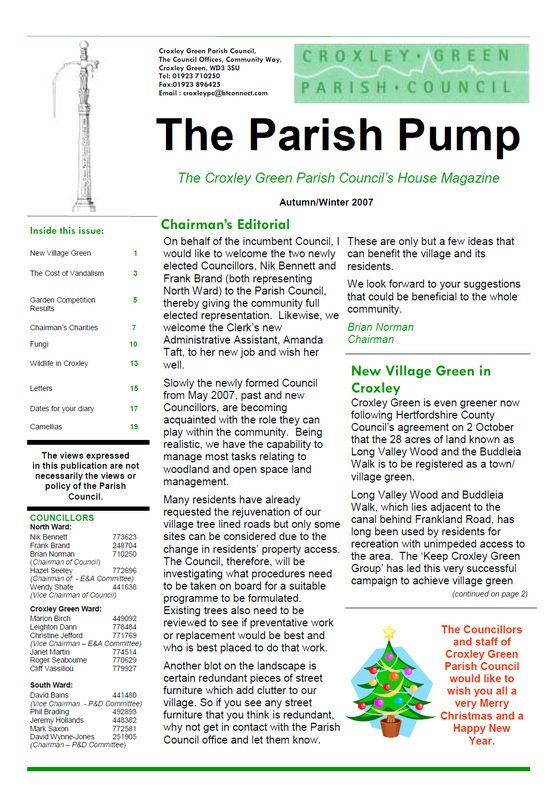 Fireworks on the Green - Many avid readers will have noted the article in the last issue of The Pump and already made a note in their diary for 31st December 2006. For those who have not, here is a gentle reminder so that you and your family can avoid the disappointment of missing this firework extravaganza. 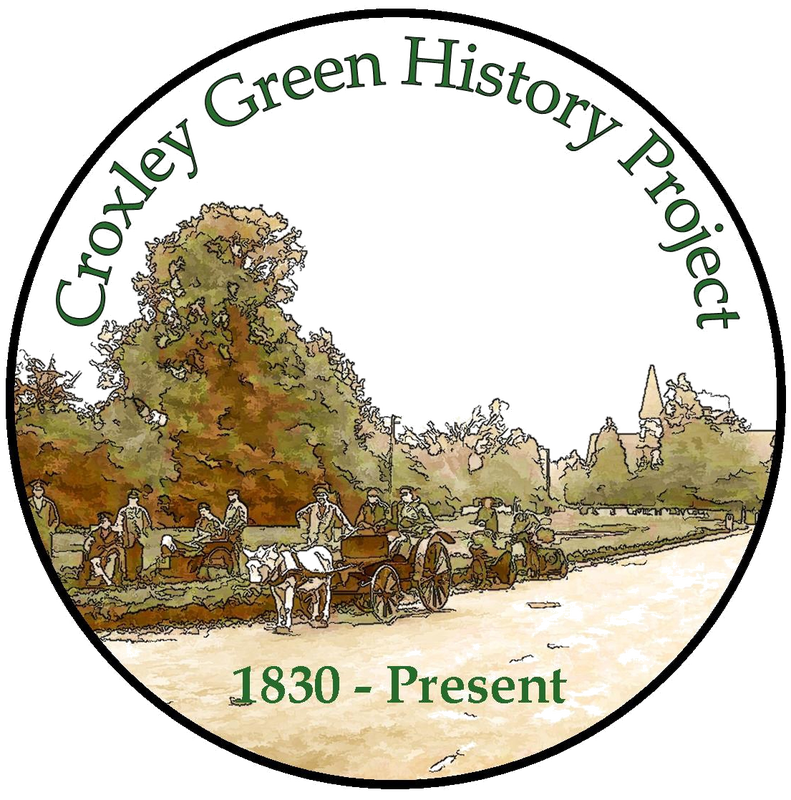 Fireworks on the Green is the opportunity for the village of Croxley Green to join together and see in 2007 with this celebration. 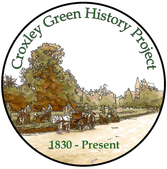 Timetable for events: Assemble on the Green from 11.45pm (near the Revels site);Fireworks commence at 12.00 midnight sharp. It is anticipated that the display will last approximately 15 minutes as we welcome in the New Year. The exciting and spectacular show is being provided by Whizzz Bang Fireworks of Kings Langley. As with any large gathering there are a few rules to make this an enjoyable and safe evening for all. School and Yorke Mead School. 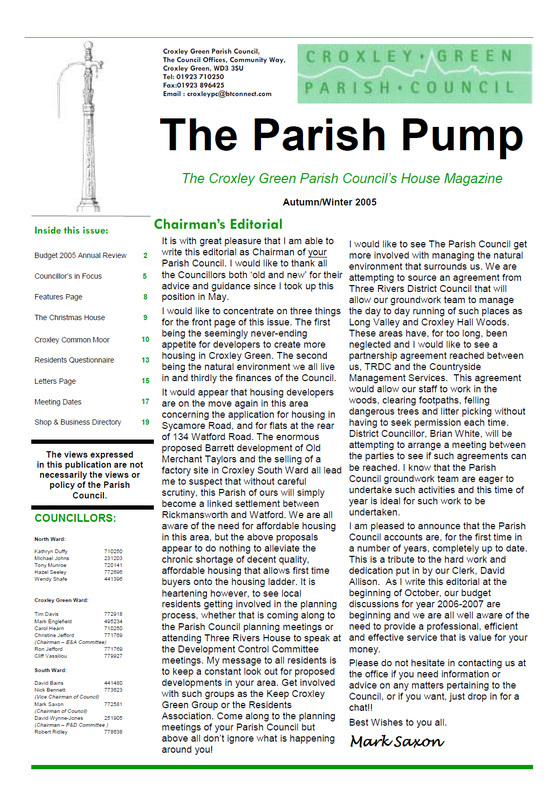 The Junior Council meetings are chaired by one of the junior members with the Clerk to the Parish Council, David Allison, providing the necessary support and guidance at the meetings. One of the first initiatives the Junior Council has focused on has been an anti-litter campaign. amount of litter that is just thrown on the ground. After only an hour some 12 plastic bin bags had been filled. As a follow up to this litter pick, pupils from each of the schools designed anti-litter posters; the winning ones will be used in an anti-litter campaign around Croxley Green. 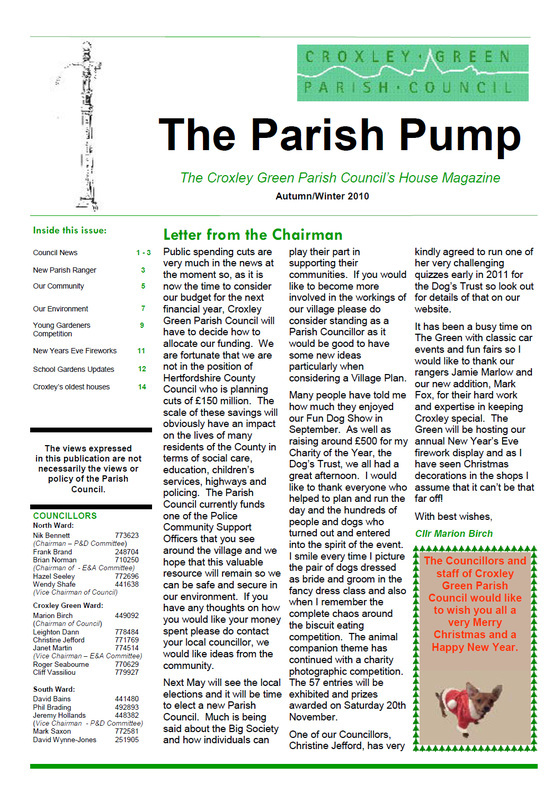 The Parish Council tried something new this year – mainly for the users of the free community bus provided by the Parish Council on Fridays (the timetable is printed on page 12). With the use of the hall at the Community Centre and organised by Cllr Christine Jefford and Helena Flynn, our Social Afternoon Tea was a great success. About sixty people were offered a great selection of cakes and biscuits as well as tea, coffee and soft drinks. Everyone had a very enjoyable couple of hours and we received many letters to say so, as well as verbal thanks. Having tried this out we would like to make this event bi-annual if possible. We are really glad that all of you who joined us had such a good time. 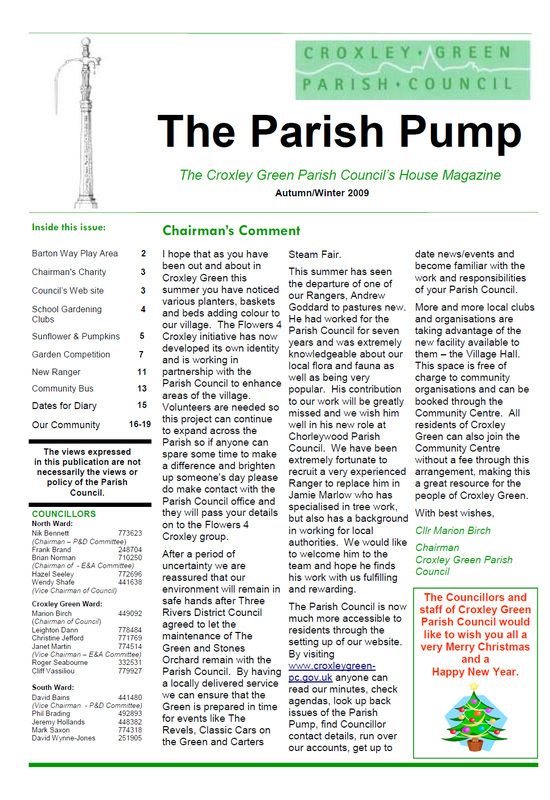 ‘New’ Village Hall for Croxley and Free Membership - At a special meeting of Croxley Green Parish Council on 12 January, the Council agreed to enter into an Agreement with Croxley Green Community Association for the provision of a Village / Community Hall for Croxley Green. The Community Association had also got the endorsement of its Members to enter the Agreement at their Annual General Meeting which was held on Sunday 11 January. 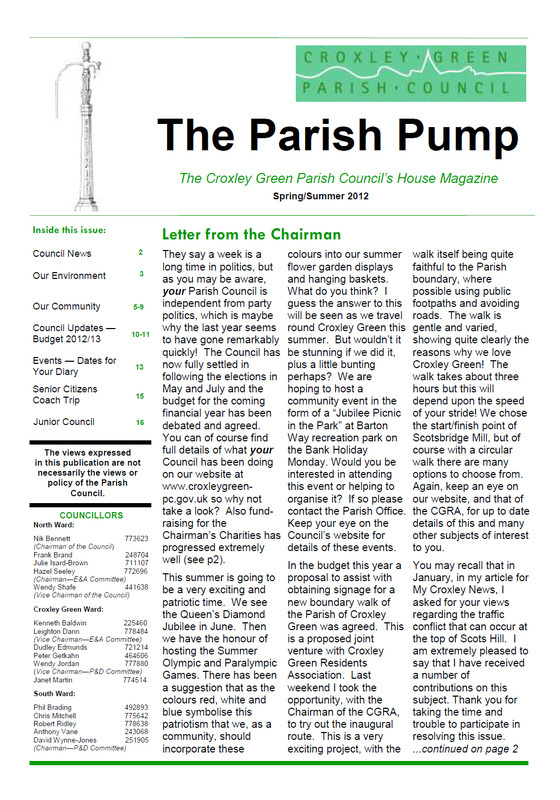 The Agreement means that ALL residents of Croxley Green may now have free membership of the Croxley Green Community Association. 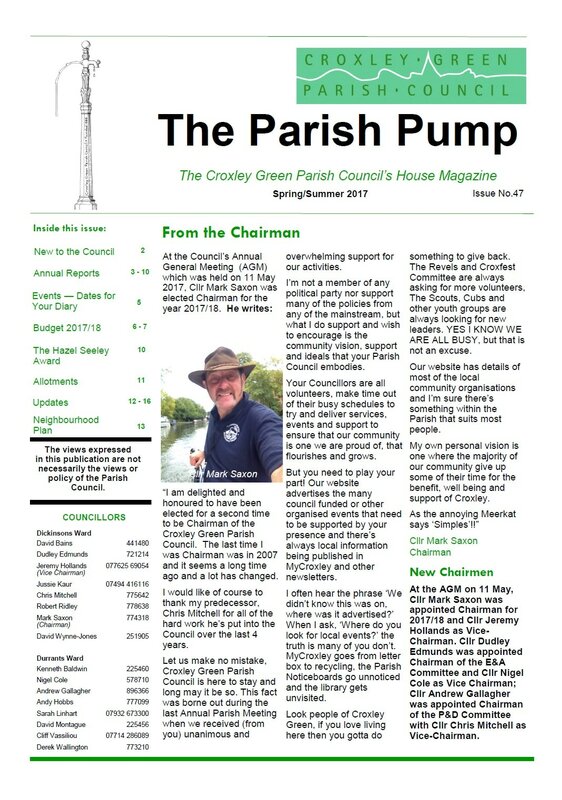 The free membership needs to be activated by filling in a form which is available at the Parish Council Office or from the Community Centre in Community Way. secateurs (we enjoyed using the proper, DANGEROUS tools!). of £10 per hour up to a maximum of £45. picture – smile, I think not as you’re nicked! The new hand held digital camera does an automatic check with DVLC to check road tax and insurance. Around Croxley Green the Auto Recognition system has been used to great success on those who think they can exceed the speed limit. In doing so they put other lives at risk and this is a message we must all remember. In New Road the speed limited is 20mph. They always try to fill them in within four working days. Many houses have large potholes outside them because so many people do not have time after a busy day’s work to report them or do not know how easy it is. that it will be ‘next to’ Queen Victoria’s Diamond Jubilee tree outside the gates of All Saints and near to the tree planted to mark the Queen’s Silver Jubilee in 1977. We hope to make this quite a big event so we will keep you posted. Country. 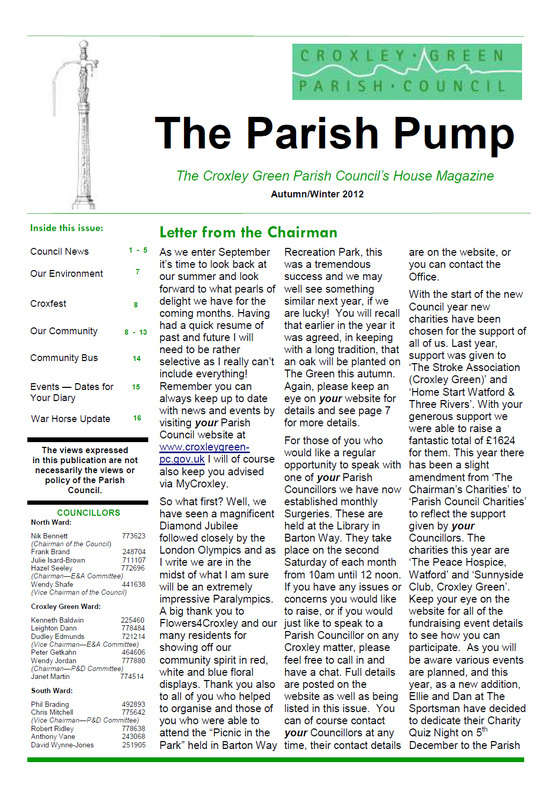 So, why have one in Croxley Green? Well, we seem to be very short on local tradition and ceremony, we have an orchard, the organiser of the event was born in Herefordshire and it will be a fun evening in a dreary month! Who will be there? 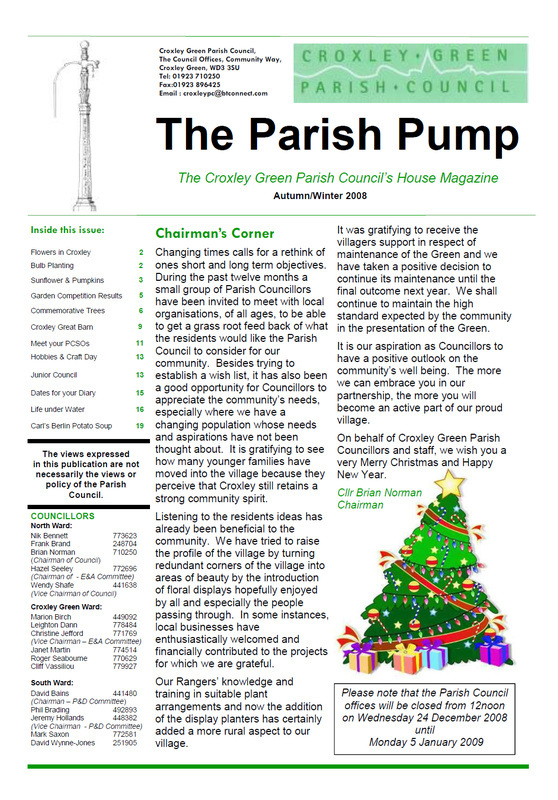 - It is all very much in the planning stage but we have invited at least one Morris Side, Folk Musicians and our very own Croxley Mummers. We hope, therefore, to have dancing, singing, playing and Mumming and, most importantly, YOU!!! like best to take home. I took home 5!! 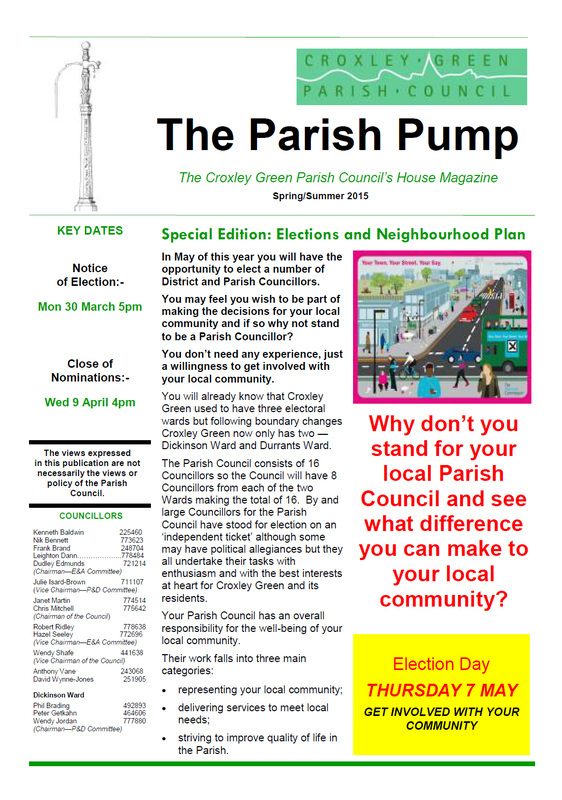 depends on what the Councillor wants to achieve and how much time is available. 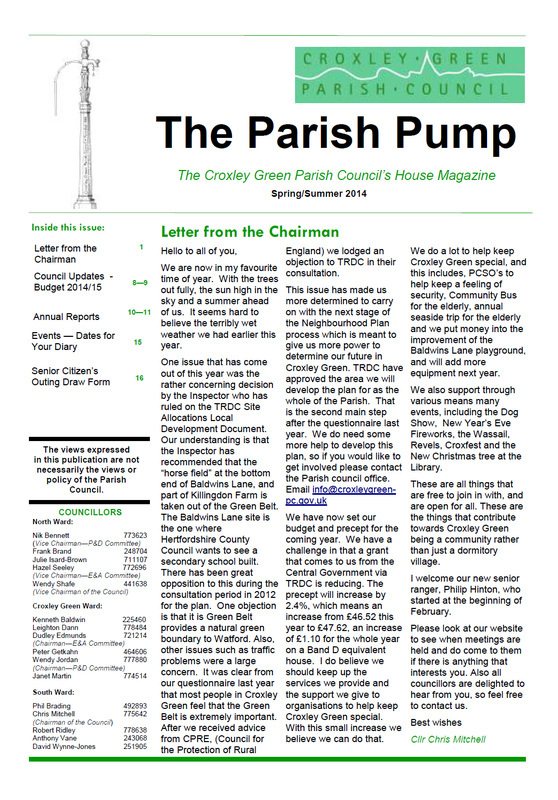 The “Hazel Seeley Award” - Last year the Parish Council agreed to present an annual civic award to someone who has improved the lives of the people within the Parish or someone who has provided services to the community of Croxley Green. 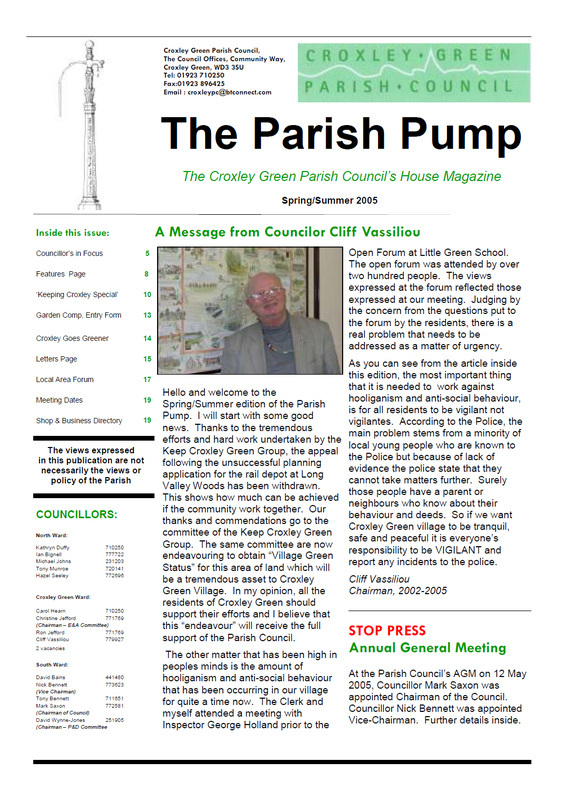 At the Annual Parish Meeting back in April this award was presented by the Chairman, Cllr Chris Mitchell, to the awards namesake – Hazel Seeley. 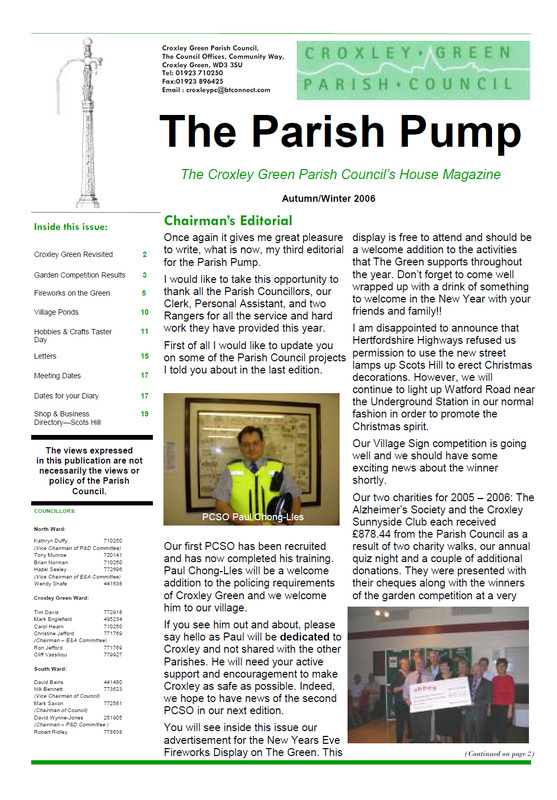 Hazel served as a Parish Councillor for 18 years up until 2015 and she was also one of the founders of the Flowers4Croxley group. 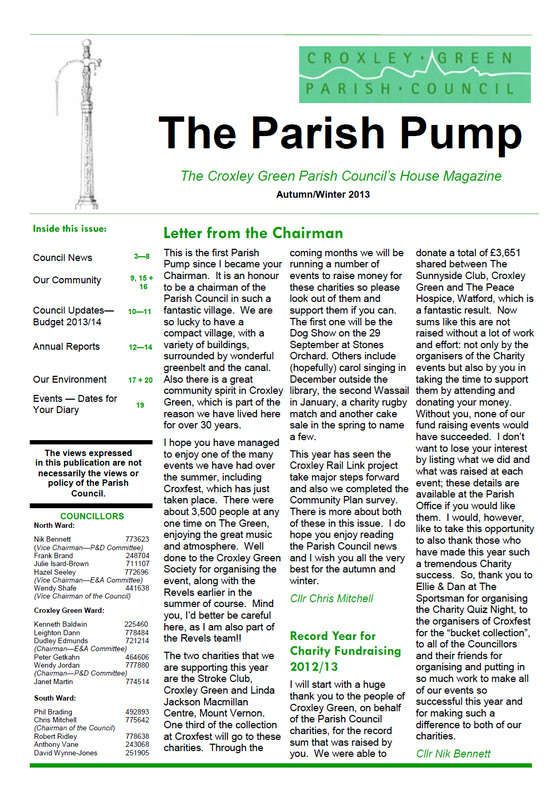 As well as this, she also helped to raise money over the years for the Parish Council’s various charities. 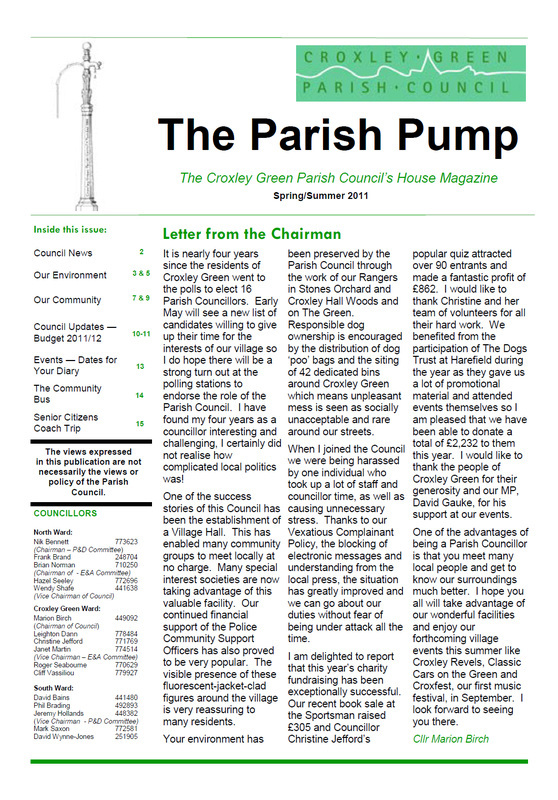 Hazel stated that she was delighted to be the first person to receive the “Hazel Seeley Award” and added that she had really enjoyed the time she spent on the Parish Council. 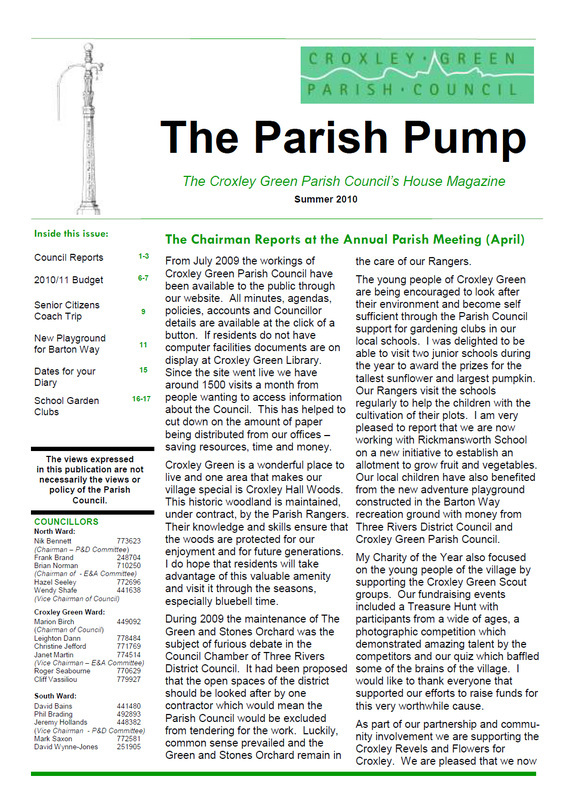 Hazel has lived in Croxley Green for 78 years and she thinks it is a lovely place to live. 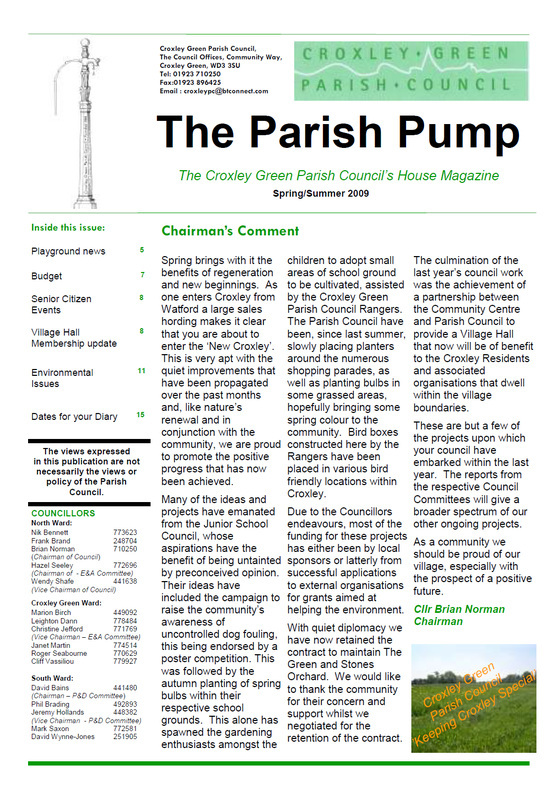 was Chairman was in 2007 and it seems a long time ago and a lot has changed." MLX. Now on back burner due to costs. They have gone very quiet on us, but basically it has gone over £50m over budget. Neighbourhood Plan - This has now been submitted to TRDC who are going through their own consultation on it. 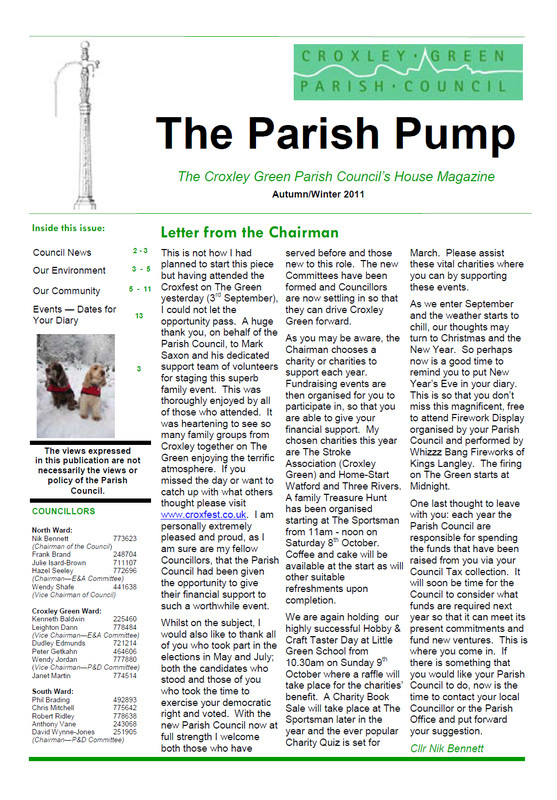 The latest version is on our website. Cllr Gallagher will update this, and many thanks to him for all the work he has put in and to the rest of the working party.